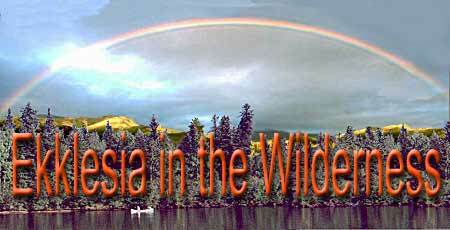 Now you can translate Ekklesia In The Wilderness into French, German, Italian, Russian, and Spanish automatically. The Greek word Ekklesia is what has been rendered church in English. Ek-Klesia is actually two Greek words. Ek which means; "out from" or "away from" and klesia which means “the called.”. So the English word Church should read the "Out-called of the called." We will now attempt to make sense of the word "Ekklesia." The call of the salvation of Christ goes out to all, and of those who hear Christ’s call and gather together these are what we would term “the klesia” or the called. But from “the klesia” there are those who sell out for God, and become Christ’s disciples, these are called “the ek-klesia” or The out-called of the called. First I need to say that this website has not been created to try to appeal to a particular denomination or those of a particular segment of experience. If you love Jesus and are actively seeking to go beyond your present veiled level of experience to a deeper more fulfilling relationship with Christ then we are of like spirit. I firmly believe that God and the Holy Spirit speak in some measure to all who are saved. So we have at times felt things, we have at times sensed things, but we have not necessarily known that God has been speaking and guiding us. When we would have sought help from a preacher or teacher we have in time realized in some measure that what they speak not from a personal knowledge of God but instead speak from the stale corn of other people books, tapes, and notes. Many of us have at times sensed that something is wrong in the church but because of deficiencies in our knowledge of scripture, deficiencies in our walk with God, deficiencies in our being able to hear the voice of God, and the fear of man we have suppressed or put aside these things, yet in our hearts these nudges of the Holy Spirit keep coming back time and again. I am nobody, and my words are only words. It is not my purpose to persuade you to believe a certain viewpoint. Recently I have discovered something quite unexpected in speaking with people of born-again and Spirit-filled backgrounds; that what I have spoken and written has confirmed things that people from both ends of the spiritual spectrum have known and heard themselves of God for years. Things that they may have questioned their pastor or elders about when they were first saved -- that subsueqently were explained away that either God no longer does that, or the church no longer does that, or we just don't believe like that today -- and yet with these sweeping explanations these things we have known never really go away -- for the Holy Spirit still speaks to men. In this website we hope to confirm some of those things that God has shown you that are wrong with the "Church." We also hope also to confirm what you have already seen and heard of Him that God still speaks to men, and confers upon those that love Him and are obedient His tokens of His affection -- true gifts and true ministry. As we grow in the grace and knowledge of Him each aspect of our life should grow and become of such a quality that the revelation and impartation of the “Word that proceedeth,” that which we hear and receive, will find both expression and fulfillment through us -- the Word becoming flesh (in us), a personal reality in our life experience, that can be "seen" and “handled” by those who are around us. That we might be a light to those who dwell in this dark generation. Not so much by what we say, but that the light of life from our relationship with Christ would be made manifest.